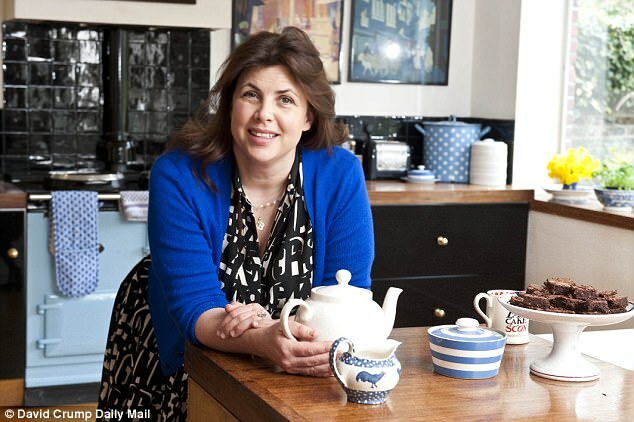 A row has erupted over the quality of new build homes after TV presenter Kirstie Allsopp told today’s buyers to avoid wasting their money on ‘shoddy’ properties. The Location, Location, Location presenter claimed some houses built from the late 1980s are poor quality, more prone to flooding and built for the short term. 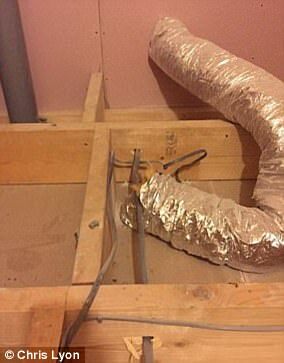 The 45-year-old spoke out after ‘misleading’ claims by a new build organisation that those in older properties were likely to spend more than £51,000 on repairs. 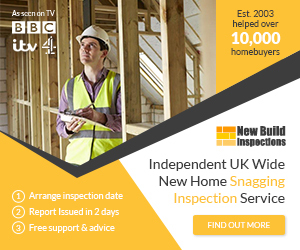 But the Home Builders Federation has hit back, saying buyers of new build homes ‘enjoy a huge number of benefits over those purchasing a second hand home’. The disagreement began when the New Homes site, which the HBF developed, tweeted a diagram of an old house with annotations of the cost of repairs. Its graphic suggested homeowners would need to spend about £6,000 on the central heating, £5,000 on windows and doors and £4,000 on external rendering. Other costs included around £5,000 on plastering, £4,000 on the bathroom, £9,000 on wiring, £4,000 on roofing, £2,500 on decorating and £800 on insulation. 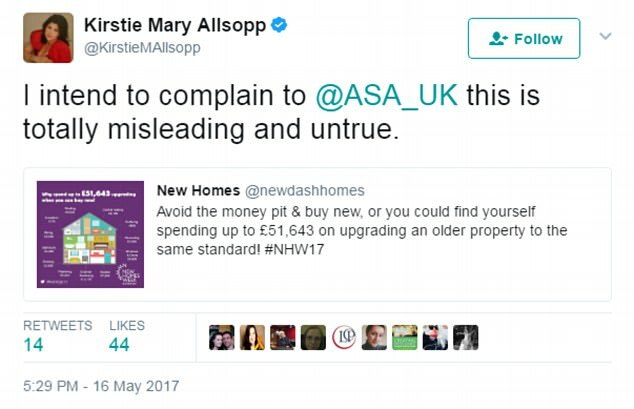 Allsopp, who presents the Channel 4 show with Phil Spencer, said the prices were both inflated and unrealistic because nobody would fix their whole home at once. 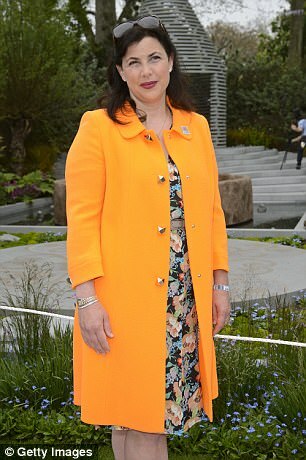 She told The Times property assistant editor David Byers: ‘I have seen some really shoddy new builds. Something being new is no guarantee it’s any good. ‘I think it is misleading and irresponsible. I go up and down the country and I am seeing a lot of older properties that have been standing for 150 years or more. In March it was claimed 298 families a week are having to move into shoddy new build homes that have not been finished as builders cut corners to meet targets. 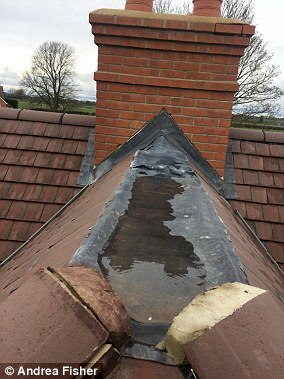 Buyers are arriving at new homes to find leaks, mould, water-logged gardens, missing windows, badly fitted doors, broken toilets and gaps in the guttering. 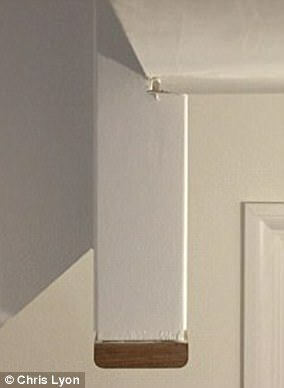 In some cases, new build buyers are discovering more than 170 faults in their homes and having to wait months for a builder to fix them. But HBF executive chairman Stewart Baseley said: ‘Buyers of new-build homes enjoy a huge number of benefits over those purchasing a second-hand home. ‘During the buying process customers will receive a high level of service and support from trained sales staff. ‘Upon moving into a property that is designed for modern living there are all the advantages of living in a home with brand new fixtures and fittings and the latest energy efficiency technologies. ‘This report helps to highlight the hidden savings that buyers of new-build homes make. While most people have a budget put aside to get the little jobs done, costs soon add up when you need to replace a bathroom or a kitchen. 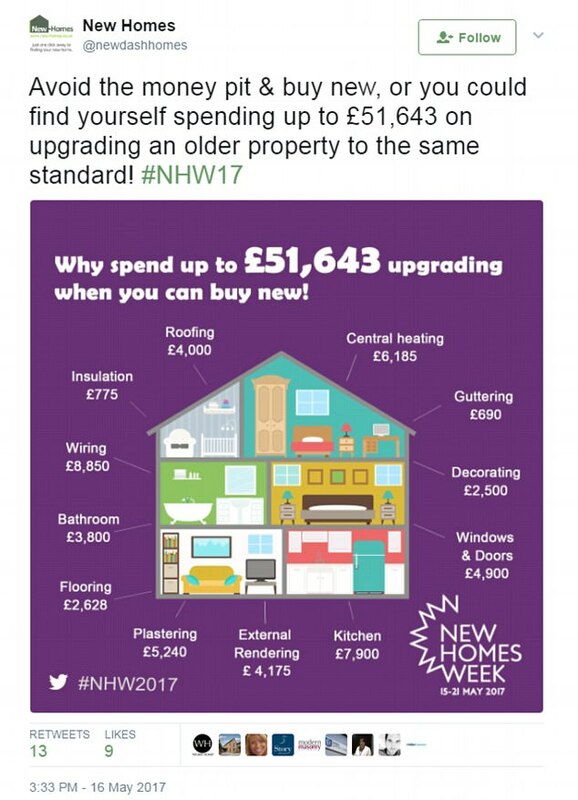 The graphic formed part of an HBF report that claimed the cost of upgrading an older property to the same standard as a new build home could be up to £50,000. 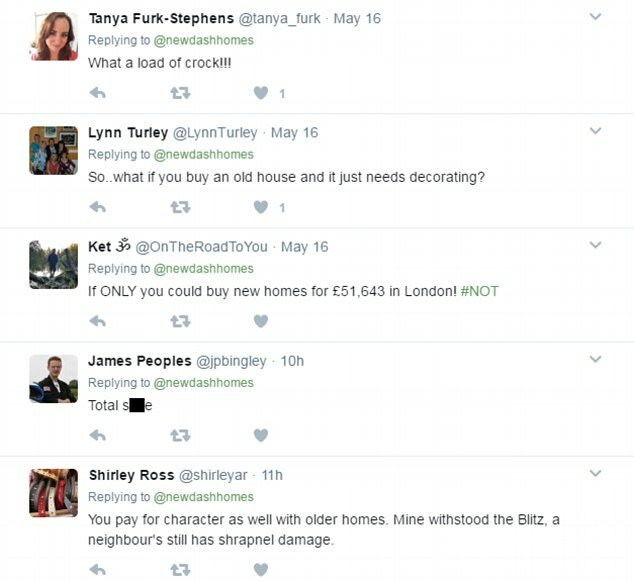 And an HBF spokesman told MailOnline: ‘The overwhelming majority of people living in homes built in the last 30 years are very happy with their home. Surveys show that more than 90 per cent of people would buy new again. ‘The report simply highlights the various costs of installing new features, fixtures and fittings that come as standard in new builds and are valued by households. ‘New builds today are built to extremely high standards and designed not only to stand the test of time like their Victorian counterparts, but also save households hundreds of pounds a year on their energy bills. And on Allsopp’s claims that new build homes are more at risk of flooding, he added: ‘Very few new homes are built in areas at risk of flooding, but those that are have considerable mitigation measures put in place to ensure they are protected in the event of a flood. But seven months later in March, work to correct a ‘snagging list’ running to 12 pages had still not been finished. 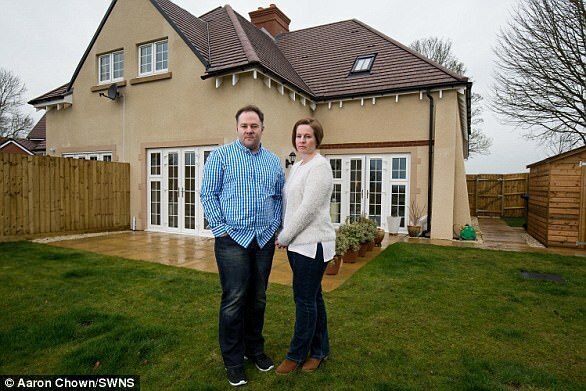 The couple said their £390,000 house in Bishops Itchington, Warwickshire, was rushed to the point that much of the interior needed replacing, including plasterwork and all the internal doors. There were problems with the lead guttering, causing water to pool on the roof, and a pipe could not be accessed. Although completion was supposed to be last May or June, Miss Fisher, 41, and Mr Antonio, 38, were unable to move in until August. Cala Homes said at the time that it had apologised to Miss Fisher and her partner and was working to put right the defects. 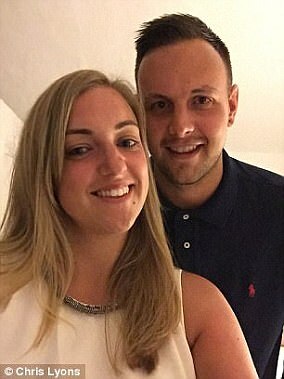 Chris Lyon, 29, and his partner Emma Hayward, 27, bought a Barratt Homes new build on the Ridgeway estate in Dunstable, Bedfordshire for £325,000 and expected it to be their ‘dream’ first home. Mr Lyon told MailOnline: ‘On our tour of our home on completion day the house was full of dust, builders tools and mouldy coffee cups. Our front door glass panel was cracked. ‘Our washing machines transit bolts hadn’t been removed and upon using this on our first night we were awoken to the sound of horrendous banging, where the machine had literally danced around the kitchen, smashing the cupboards, kick boards, and plates that were on the sink side. 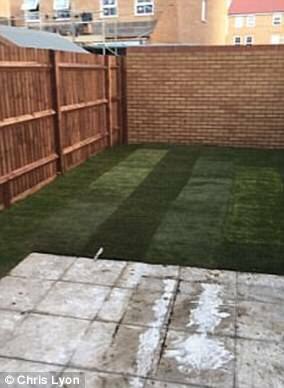 ‘Our garden patio was stained with builders’ paint and plaster. 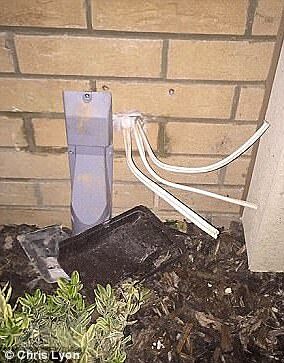 ‘Our electric shower hadn’t been sealed in where the electric power cables connect to it and the Virgin Media cables were hanging out of the front of the house as the builders had smashed the box off the wall. Mr Lyon added: ‘We had Barratts staff using our toilets when they came to rectify snags, leaving lights on, spilling paint on the new carpets, plaster on the sofa and carpets, and actually breaking our sofa. 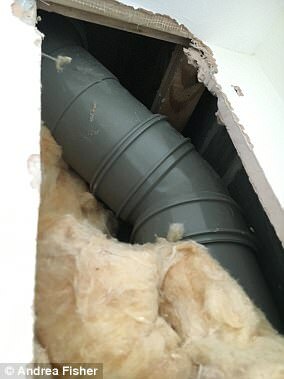 ‘The tiles in the house were not the tiles we originally chose when we purchased the property and the tiling in the en suite bathroom was horrendous. 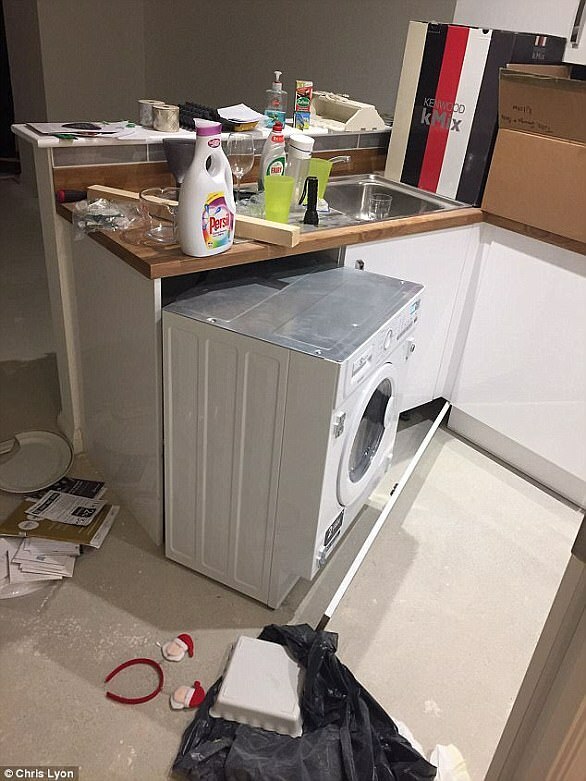 A spokesman Barratt Homes said in March: ‘We are aware of the issues raised, our MD Ian Sadler has already met with the customers, and we currently have workmen in the property resolving any outstanding issues’.